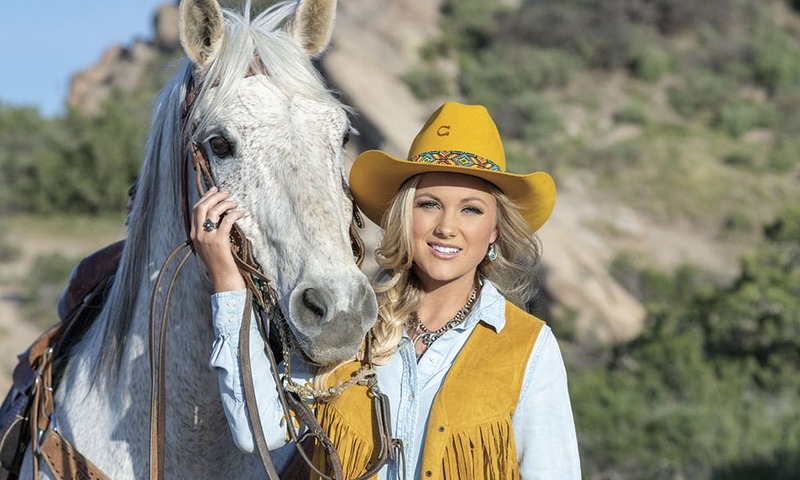 PBR Sports Reporter Kate Harrison enjoys a career suited for a cowgirl. Kate Harrison rides one of her family’s roping horses at Vasquez Rocks. All photos by Ken Amorosano. Life has a certain way of rewarding those who put their noses to the grindstone to go after what they want. It also helps when the stars align to deliver the perfect match to a Western life with horses, rodeo, and the opportunity to act as a stunt person in movies and television at a very early age. Add to this a small-town upbringing on the edge of a very big city, a love for team roping, sports, and motorcycles, and a devoted close-knit family whose advice is not only shared and trusted, but also taken. 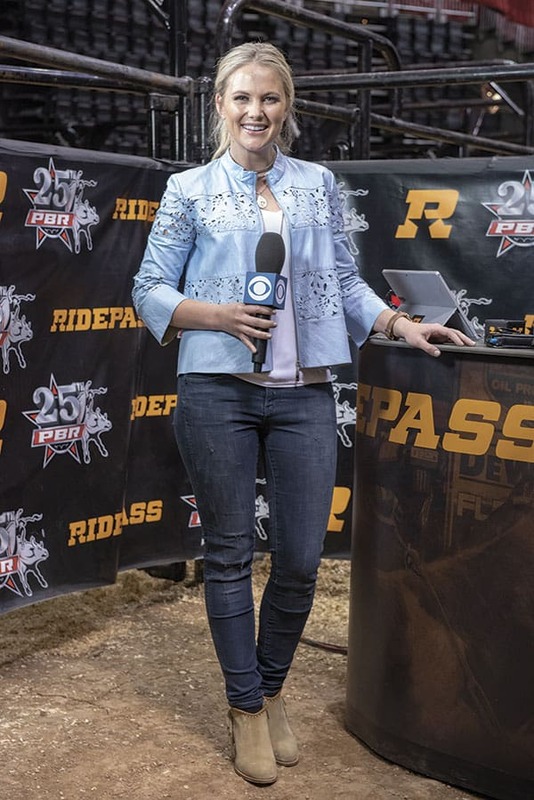 These are but a few of the elements that have guided the life and career of Kate Harrison, the daughter of an ardent team roper and professional stunt man, and now a fast-rising star as a CBS Sports reporter for the Professional Bull Riders (PBR). It all sounds perfect—and it really is! Kate was raised in and around Agua Dulce, a rural small town just 30 minutes north of Los Angeles. From as early as she can remember, she was atop a horse riding—learning, and competing with the encouragement of her father, Tony Lee Boggs, a dyed-in-the-wool team roper and professional stunt man and coordinator. Agua Dulce finds itself smack-dab in the middle of the Western movie business due to its proximity to Vasquez Rocks, which fans of classic Westerns will recognize for its craggy features of slanted alluvial rock formations, that look…well—right out of the movies. 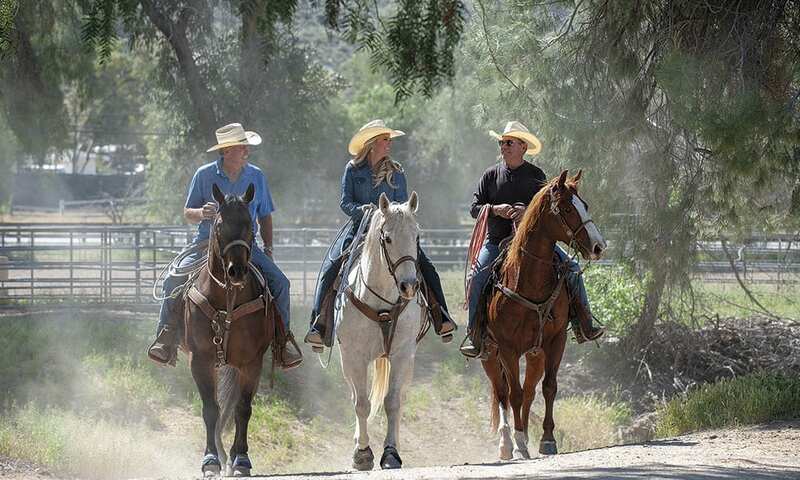 Agua Dulce is also in close proximity to Gene Autry’s old Melody Ranch, the preeminent movie set where countless Westerns starring the likes of William S. Hart, Gary Cooper, Tom Mix, Roy Rogers, and John Wayne were filmed and where the TV series Westworld is currently being shot. 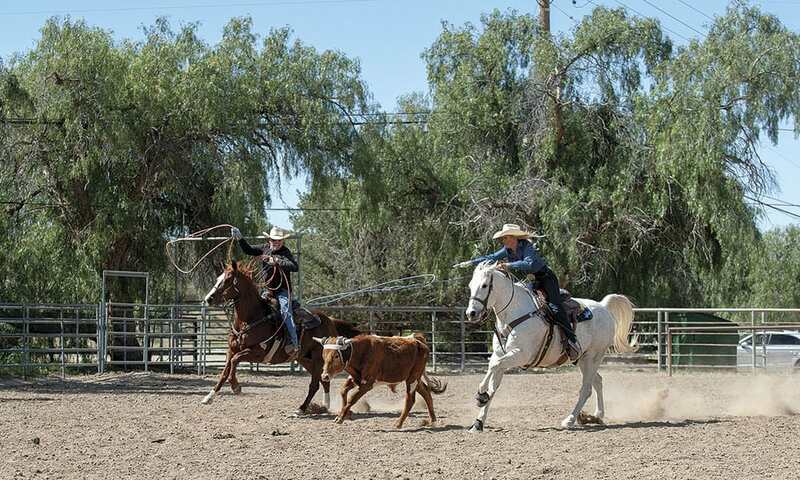 Agua Dulce is also a bastion of team ropers, stunt work, and rodeo, and a core part of Kate’s life experiences and passions. COWGIRL caught up with Kate in Agua Dulce where we photographed and interviewed her at the ranch of family friend and legendary stunt coordinator, Walter Scott, who, as a secondary father figure, played a big role in Kate’s adventurous and cultural upbringing. Kate and her dad, Tony getting in a little team roping on Scott’s ranch. “I grew up in a town that has one stop sign. You can ride your horses down to the market,” says the vibrant young cowgirl. “We’d tie them up and go into the Mexican restaurant to eat. It was that kind of town: Everyone knows everyone. My best friends, ‘till this day, their parents are some of my parent’s best friends. Her mom, Sandy, a nurse who worked nights, put Kate and her sister in the nurturing hands of their dad during the day. Kate was seven when she started junior rodeo, taking on every event they would let her compete in. She rodeod all the way through high school, where she made it to state all four years in multiple events, and to the national finals three of those years. Although Kate had aspirations of taking the path to a rodeo college, her dad advised otherwise. “Dad always said do this for fun because, when you have to do it for a paycheck, when you’re living paycheck to paycheck, it’s not the same.” She applied and was accepted to the University of Southern California where she studied journalism and covered college football games on Saturdays, and still came back to rope with her dad and friends on Sundays. Walter Scott, Kate, and Kate’s dad Tony Lee Boggs, on Walter Scott’s Agua Dulce ranch. There was another major aspect of Kate’s upbringing that comes into play. Kate’s dad and his best friend and roping buddy, stunt coordinator Walter Scott, hooked Kate into the movie business. She got her first stunt job at age seven doubling as a little boy in the TV series, The Magnificent Seven. She was to be saved from being run over by a team of running horses and covered wagon. Kate continued doing stunt work with her dad and Scott leading to riding stunts and horse falls. “Walter Scott is my dad’s best friend. He’s the kind of guy that would never tell you how cool he is, but if there’s a big Western that’s out there, he’s probably the guy behind it,” Kate explains as tears well up in her eyes. “He’s someone my dad’s always looked up to, and it’s always been cool to see their relationship together. But this is where my childhood was. After school every day, we would come over here. We’d team rope and practice for hours. “This is the place where I learned the true Western lifestyle. It’s based on a whole lot of hard work, but a whole lot of fun. You couldn’t ask for a better way to grow up. Kate at work in Phoenix with the PBR. Kate credits her upbringing in the world of rodeo and the movie stunt business for her desire to be a journalist, and to write and tell stories. “I didn’t grow up with girls, really,” says Kate. “I grew up with the guys outside, throwing the football on the movie sets. They’d bring all the stunt pads out, and we’d play around. We’d jump off the air rams, and we’d do flips. That’s just what I knew. I knew football, and I knew racing motorcycles. Since I love storytelling and I love sports, it just kind of naturally came together. “My job with the PBR is not just sports reporting. It’s not just talking about what’s happening. My job is to get America—your general sports fans—to see these guys and see what athletes they are. A lot of people that might see bull riding or rodeo for the first time, they don’t understand that it’s true athletes out there doing this. Then about four years ago Kate’s sister introduced her to Randy Bernard, a behind-the-scenes rodeo sports entrepreneur, who was instrumental in the success of the PBR and of The American, the world’s richest one-day rodeo. It was at The American that Kate’s big break was to come. After a meeting with the heads of production for the PBR, Kate’s dream became a reality. She was hired to cover pre-show events and eventually brought on full-time as a sideline reporter where she has excelled ever since. 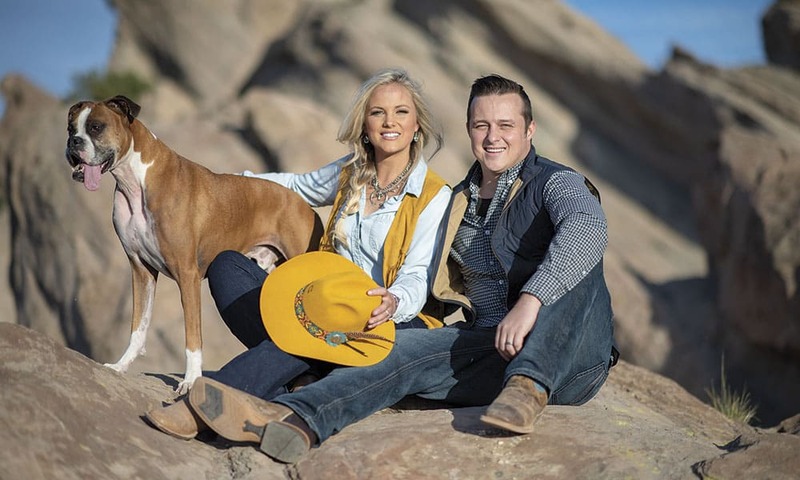 Kate and husband Daniel with their dog Peyton. Kate’s life on the road is hectic. She travels extensively to cover the frequent televised PBR events across the country. Married two years ago to long-time sweetheart, Daniel Harrison, who travels by her side to most events, the busy life suits the couple well. Kate’s hair & makeup by Julie Koeth.